Tommaso Sandonnini, Del Padre Guarino Guarini, Chierico Regolare (Modena: Vincenzi e nipoti, 1890). In 1890, the Modenese archivist Tommaso Sandonnini published a lengthy article on Guarino Guarini in the local history journal Atti e memorie delle RR. Deputazioni di storia patria per le provincie modenesi e parmensi. 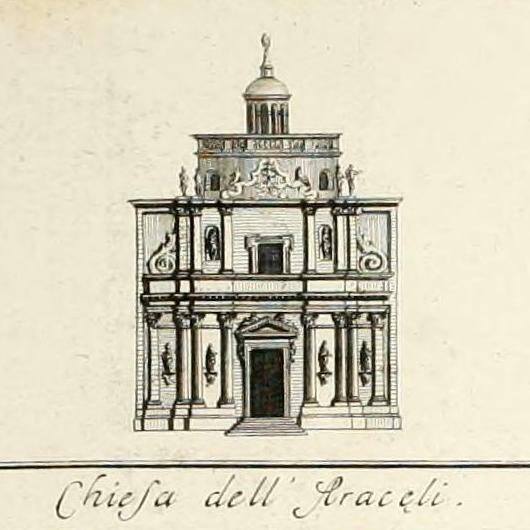 The text, entitled “Il padre Guarino Guarini modenese,” provided the first modern biography of the Theatine architect, an impartial account of his life based on archival sources. 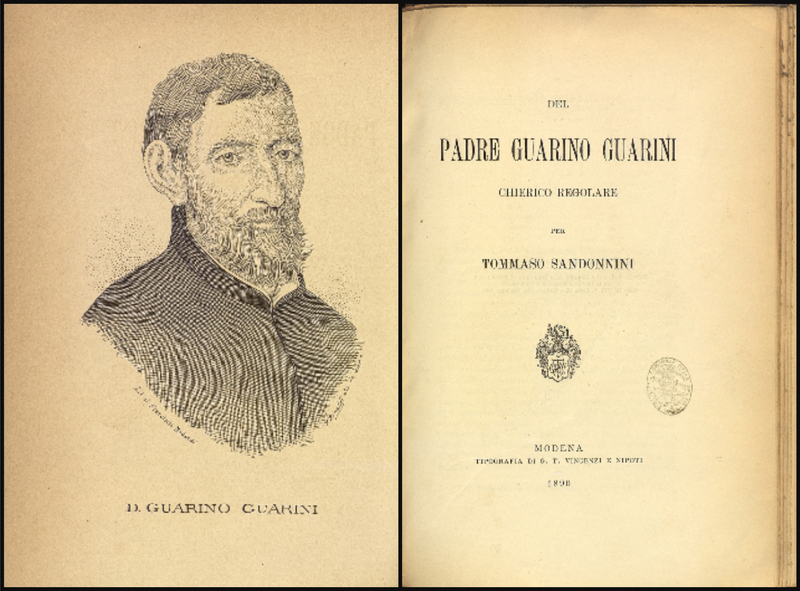 The same year, the study was issued as a stand-alone booklet (or offprint) of 54 pages, with a slightly altered title: Del Padre Guarino Guarini, Chierico Regolare (Modena: Vincenzi e nipoti, 1890). The contents of the two versions are identical. On the basis of the Modena archives, Sandonnini’s investigation traces Guarini’s family origins and youth in Modena up to the point he left for Rome in 1639 for his novitiate in the Theatine order at San Silvestro al Quirinale. Sandonnini resumes his narrative with Guarini’s return to Modena for ordination in 1647, and follows Guarini’s early years as a priest at San Vincenzo, Modena, through the 1650s. Sandonnini notes Guarini’s visit to his dying mother in summer 1662, and presents information regarding his time in Paris via letters from the Vigarani preserved in the Modena archives. 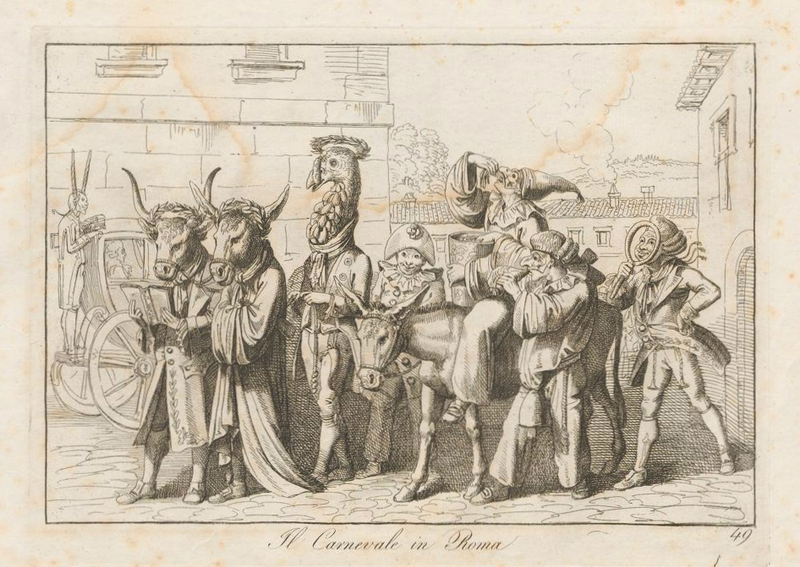 The archivist publishes correspondence between Guarini and figures of the d’Este court during the 1670s and 1680s. Other sections of the study give an overview of Guarini’s published books and major architectural projects. 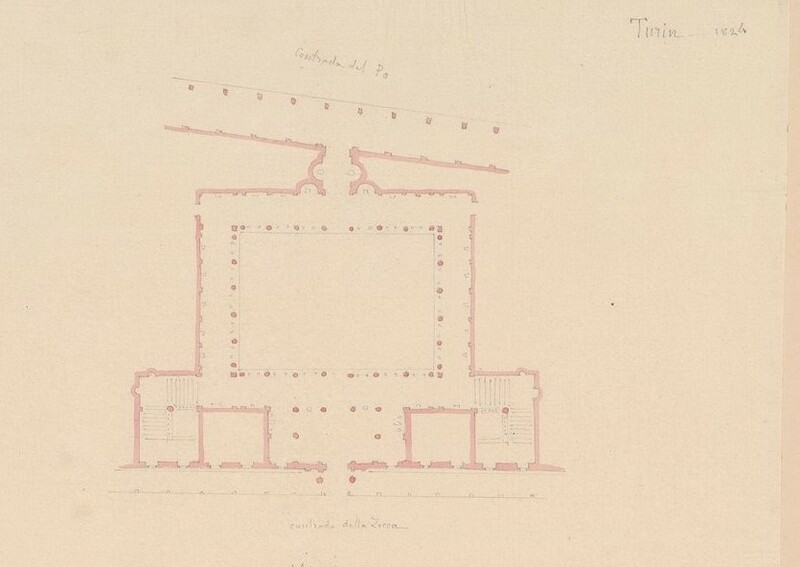 Sandonnini fails to recognize Guarini’s role in the design of the Theatine casa of San Vincenzo in Modena, but he posits the Theatine’s involvement in campaigns at the Palazzo Ducale, Modena (a theory since viewed with scepticism). In any case, he avoids a judgmental assessment of the baroque architect, in marked contrast to most 19th-century writing on Guarini’s architectural work. Tommaso Sandonnini (1849-1926) studied law and worked as a notary before becoming director of the Archivio Storico Comunale in Modena in 1897. In this capacity, he was active in archaeological and preservation efforts in the city, and wrote numerous studies on a range of historical topics, particularly those involving Modena. Today, another sixty years down the road, Sandonnini’s article remains as fundamental as ever. Along with the works of Alessandro Baudi di Vesme and Augusta Lange who explored the archives in Turin, it furnishes the essentail documentary basis for Guarini’s life and career. 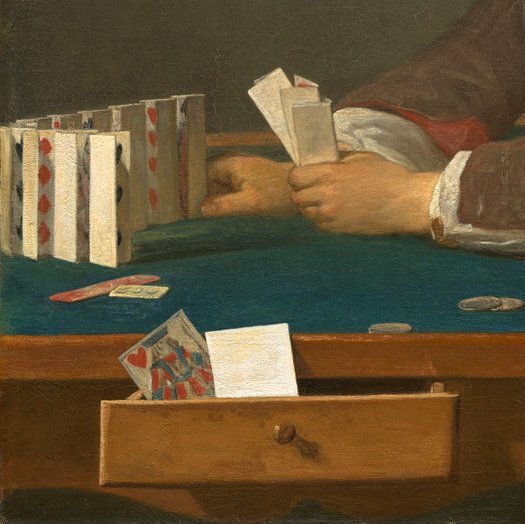 Thanks to Italy’s wonderful Internet Culturale and the Biblioteca civica Ubaldo Mazzini in La Spezia, the booklet version of Sandonnini’s study is now available open access online, and may be downloaded as a PDF for non-commercial use. On Sandonnini’s life and writings, see Giulio Bertoni, “Tommaso Sandonnini, 1849-1926” and Giovanni Canevazzi, “Bibliografia di Tommaso Sandonnini,” Atti e memorie della R. Deputazione di storia patria per le provincie modenesi, Ser. 7, vol. 5 (1928): 7-28 and 29-42. 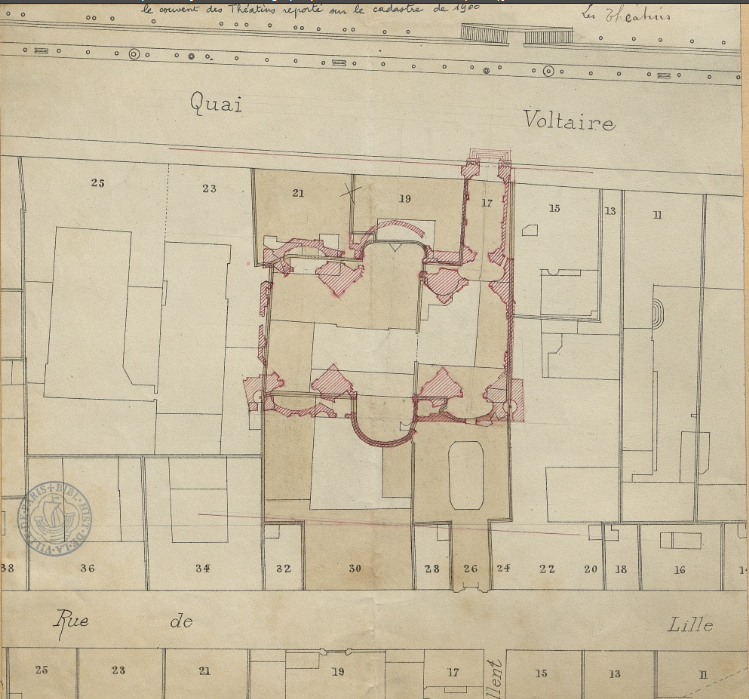 Earlier this year, the Bibliothèque Historique de la Ville de Paris (BHVP) made some image collections pertaining to various historic buildings in Paris available online. The holdings may be searched via the library’s own online catalogue, or through the Gallica portal of the Bibliothèque nationale de France. The files (recueils iconographiques) consist of prints and drawings relating to each building grouped together and pasted on large sheets of cardboard – a kind of analogue forerunner of Pinterest boards. The Theatine church of Sainte-Anne-la-Royale, designed by Guarino Guarini, is documented in six images pasted on three boards. Most of these are already known in one form or another, but a cadastre plan dating to 1900 is particularly interesting. 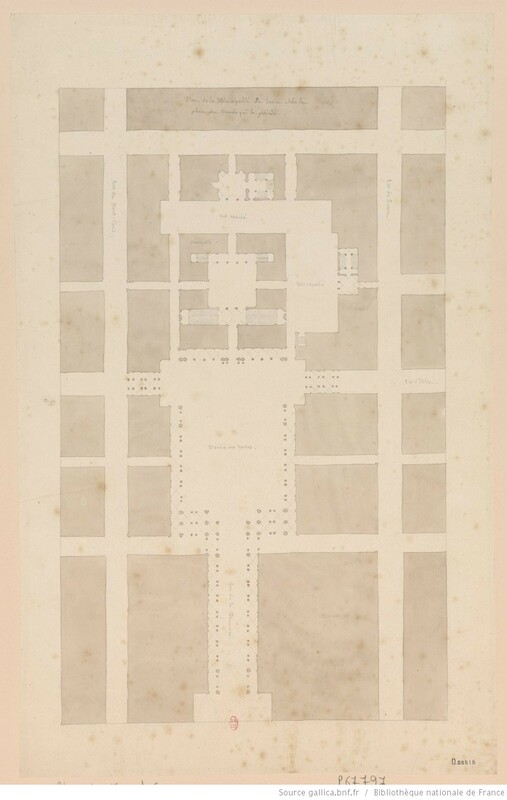 It provides additional information about the position of the unfinished church in the block between Quai Voltaire and the Rue de Lille. 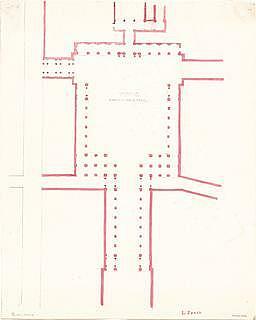 The church plan, signified with pink-red cross hatching, is superimposed on the plans of the buildings that were built on the site after Sainte-Anne was securlarized and partially demolished in the early nineteenth century. These nineteenth-century buildings incorporated portions of the church structure, and remain on the site today, with few alterations in respect to the plan of 1900. 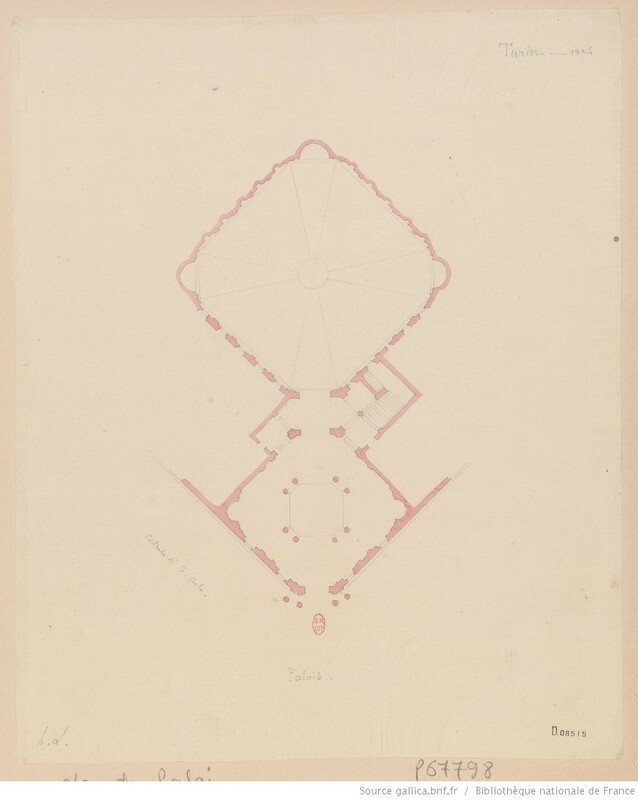 To see other plans of the site for comparison – Blondel’s 1752 engraved plan, and a satellite view of the block on Google Maps today – visit Guarini Sites Outside of Turin. To learn more about Sainte-Anne-la-Royale, see the posts on this website tagged with “Paris“. Piedmontese Baroque architecture – indeed any Baroque architecture – never figured widely in the drawings prepared by nineteenth-century architects on study tours of Italy. 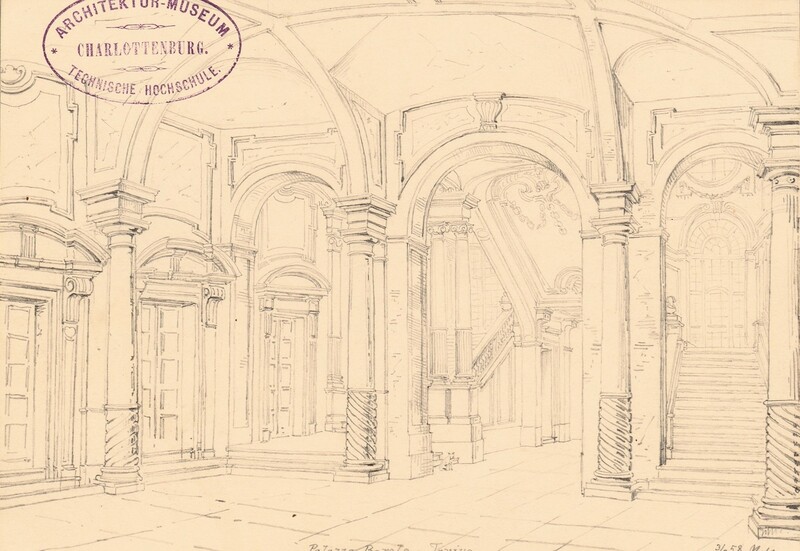 With the increasing availability of open access digitized image collections, one can search and compare thousands of such sketches and more formal studies in repositories such as Gallica, the architecture museums of the TU Munich or TU Berlin*, and the Massachusetts Digital Commonwealth collection. 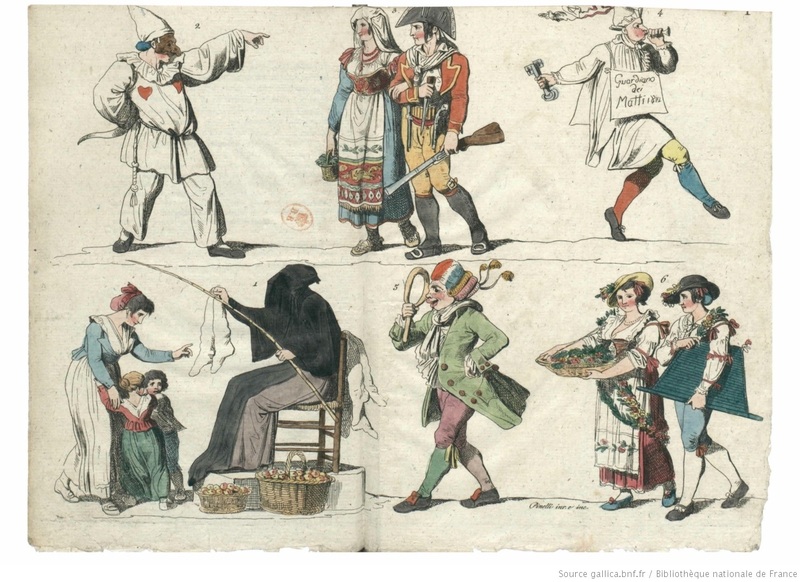 These sheets typically depict monuments of classical antiquity, the medieval period, or the Renaissance, but occasionally one finds examples recording Baroque buildings or urban ensembles. 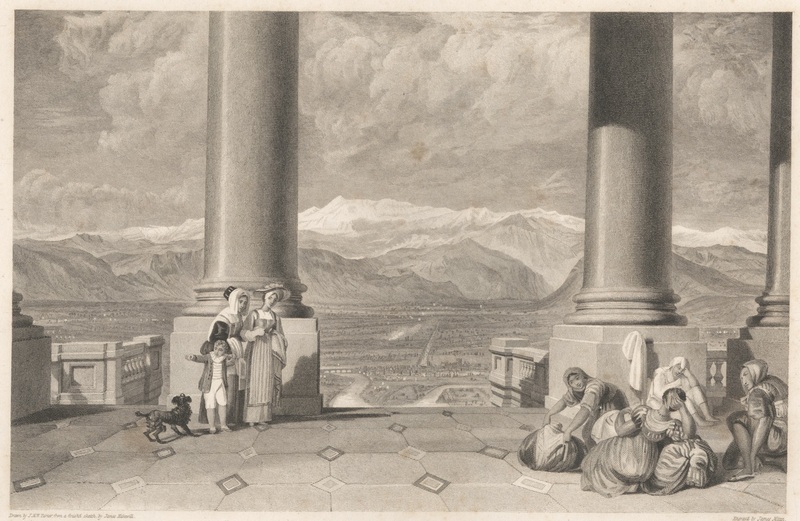 Nohl Maximilian (1830-1863), Palazzo Barolo, Turin: Perspektivische Innenansicht. Bleistift auf Papier, 20,6 x 30,7 cm (inkl. Scanrand). Architekturmuseum der Technischen Universität Berlin Inv. Nr. 13931. Public domain mark. 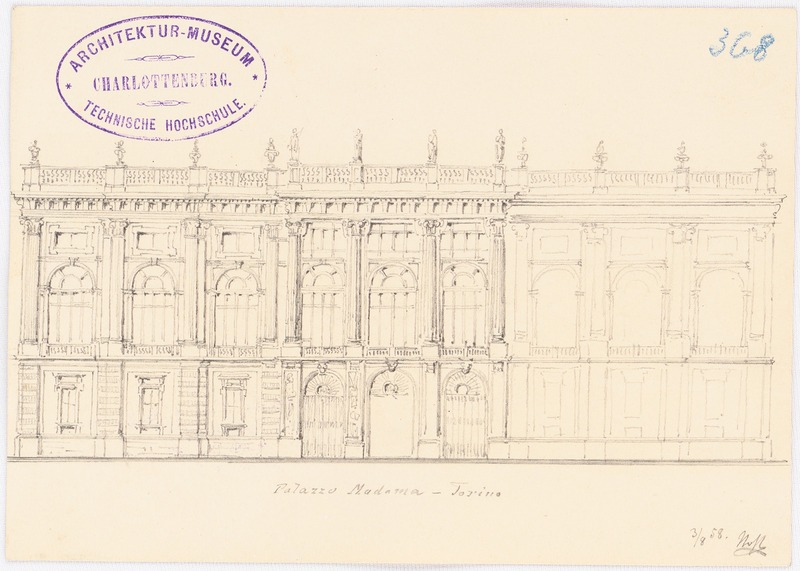 Nohl Maximilian (1830-1863), Palazzo Madama, Turin: Ansicht. 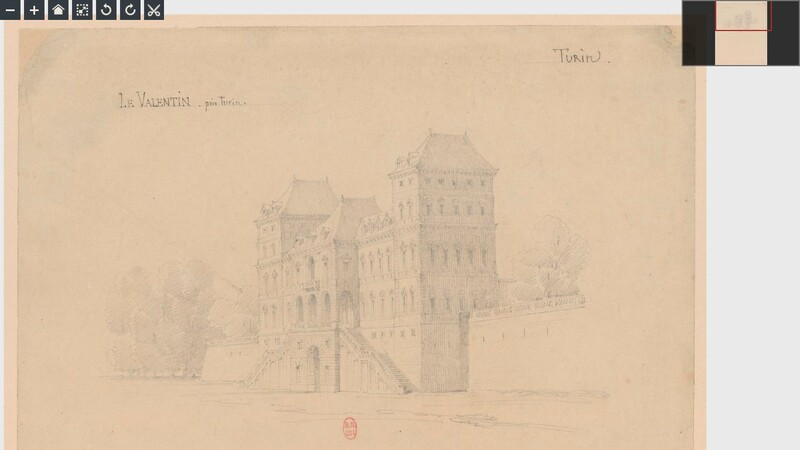 Bleistift auf Karton, 12,2 x 17 cm. Architekturmuseum der Technischen Universität Berlin Inv. Nr. 13895. Public domain mark. 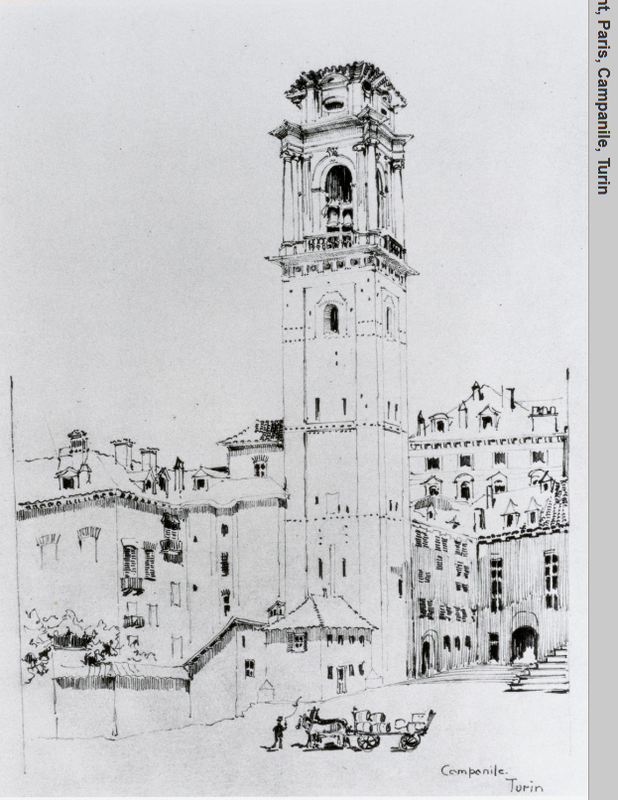 Stiehl Otto (1860-1940), Skizzen- und Fotoalbum 4: Palazzo delle due torri, Turin: Details. Bleistift auf Papier, (inkl. Scanrand). Architekturmuseum der Technischen Universität Berlin Inv. Nr. 57189,008. Public domain mark. Source: Yale Center for British Art. Public domain. 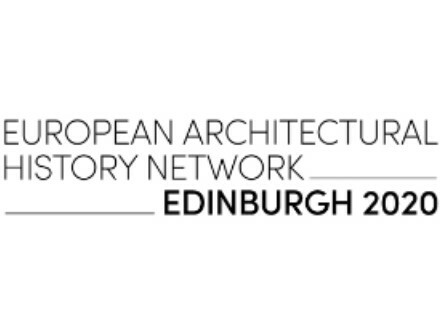 * Kudos to the Architekturmuseum der TU Berlin for its recently implemented public domain policy and the convenient metadata attached to its image files. 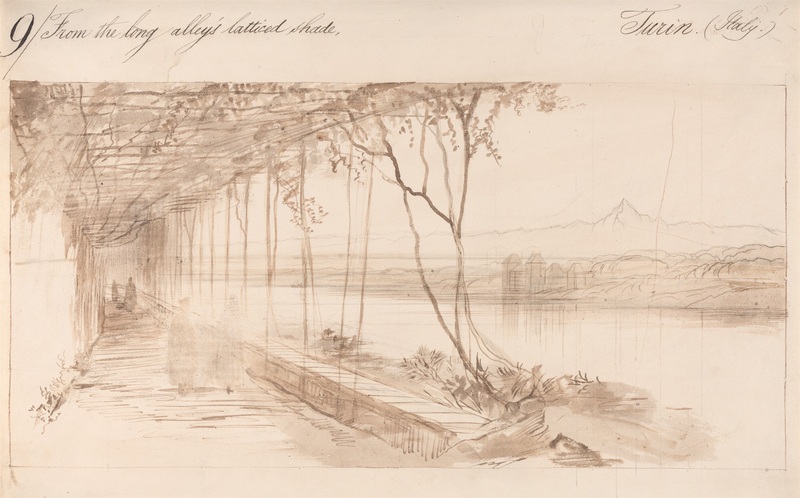 ** I have consciously omitted from this selection the numerous drawings of Turin available in the Joconde database by the French artists Prosper Barbot and Pierre-Adrien Pâris, and may return to them in the future. My review of Cornelia Jöchner, Gebaute Entfestigung. 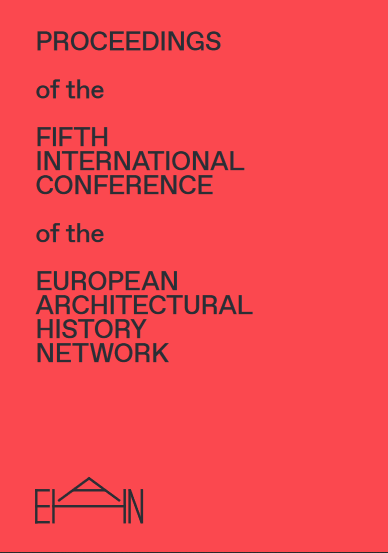 Architekturen der Öffnung im Turin des frühen 18. und 19. Jahrhunderts (Berlin: De Gruyter 2015) appears in the May issue of Kunstchronik. The book explores two architectural ensembles built outside Turin’s historic city walls – Superga, and Piazza Vittorio with the church of the Gran Madre di Dio. It analyzes these in the context of the spatial turn, situating them within a long-term process of defortification. Download a PDF of the review here. How does a city become an open city after a long history of being walled? 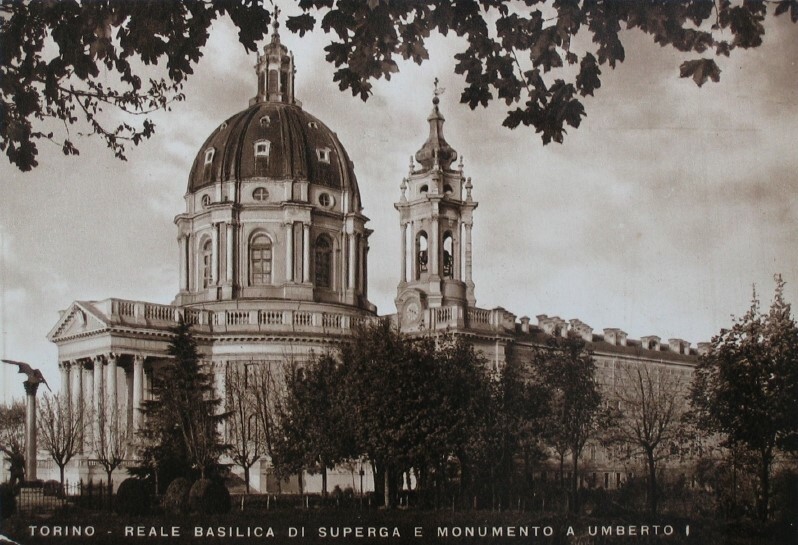 Turin is notable in this regard for two important architectural ensembles: the Superga Basilica and Piazza Vittorio Emanuele. Defortification means destruction as well as the creation of new spaces. 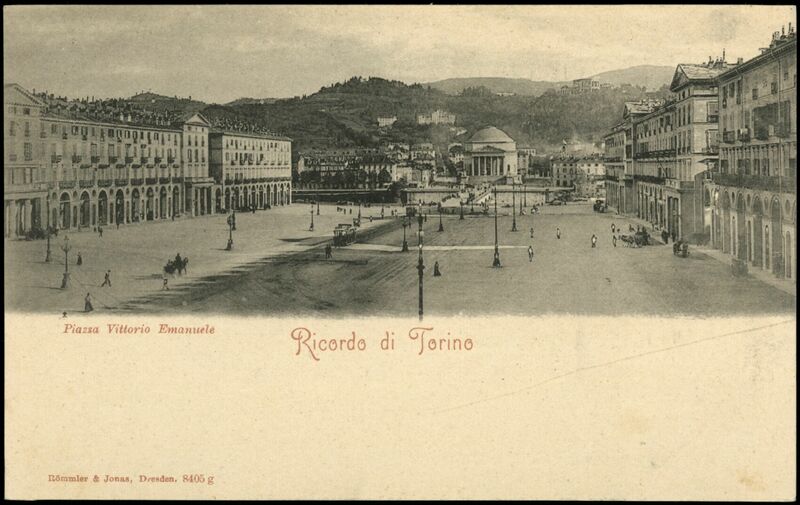 The architectural features at the edges of Turin give evidence to these changes in a very specific way, for they contributed to a new political order in the city and country. Jöchner’s book has been widely reviewed, with the following two essays available online and open access. Of the two, I found Meinrad von Engelberg’s assessment of the volume quite similar to my own. ● Meinrad von Engelberg: [Rezension zu:] Jöchner, Cornelia: Gebaute Entfestigung. 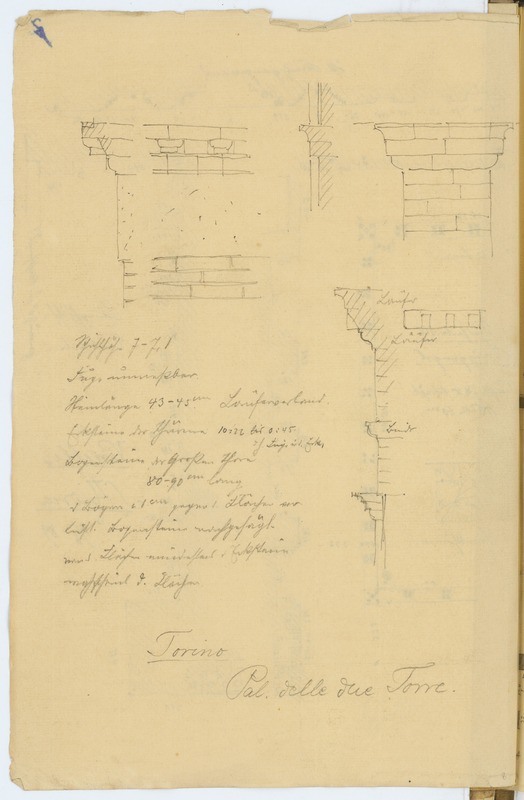 Architekturen der Öffnung im Turin des frühen 18. und 19. Jahrhunderts (= Studien aus dem Warburg-Haus; 14), Berlin 2014. 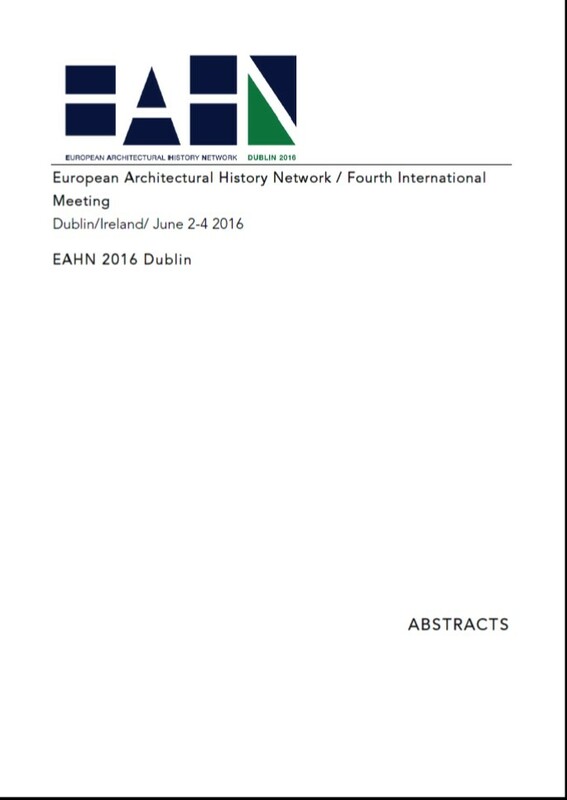 In: H-ArtHist, Oct 2, 2015 (accessed 29 May 2016), http://arthist.net/reviews/11139. in KUNSTFORM 17 (2016), Nr. 2, http://www.arthistoricum.net/kunstform/rezension/ausgabe/2016/2/. The title of this old commercial for the Detroit Institute of Arts says it all: please sign this petition begun by Professor Jeffrey Hamburger of Harvard University and addressed to Mr. Kevyn Orr, Detroit emergency manager. As a Detroit-area native and former DIA employee, this cause is very important to me. We, the undersigned, write to express our profound dismay at the news that the city of Detroit is considering auctioning off the collections of the Detroit Institute of Arts to meet the city’s obligations as part of the current bankruptcy proceedings. The Institute of Art’s collections are not only among the finest in the United States; they rank among the greatest in the world and contribute to the city’s international reputation. To sell them, in whole or in part, would seal the city’s shame, dispose of one of the most visible manifestations of its proud history, and inflict permanent, irreparable harm on the city as a center for culture, tourism and commerce. One doesn’t help a patient, even one who’s very sick, by cutting out his or her heart. We urge you to resist the pressures being brought to bear by creditors to resort to what would be an act of draconian cultural iconoclasm without parallel in modern times.